Magnetize your prosperity and love Into Reality – You Can Have it All! What would your life be like if you were sure you would succeed; if you knew you were utterly taken care of no matter how you choose to love and prosper? You hold the dream, the intuitive knowing, the vision, or the desire for what you want to create – now. 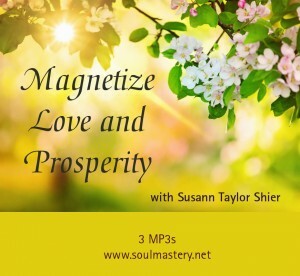 Susann’s Magnetize Love & Prosperity Course will give you the means to activate abundance in your life. Learn the secret to soulful manifestation of everything you choose. Gain sacred entrance to the unstoppable potency of Spirit, to galvanize your visions and intuitive knowing into reality. This course gives you DIRECT, EXPERIENTIAL TOOLS to be fully available to land in the field of your dreams and transform them into the tangible. This could include a new purpose-filled career or entrepreneurial opportunity, a relationship, a creative endeavor or all of the above. – Journey deep into the universal heart of creation and KNOW without a shadow of a doubt that you are always held, supported, taken care of, and deeply loved in all you create. – Discover how to drop all your excuses for shining brightly in the world. – Have a love affair with your authentic creative self. – Know that you are always taken care of in all you create. – Experience your vital relationship to masculine creator energy that propels you forward and gets your motivation to magnetize activated. – Embody your ability to deliver and succeed in all that you value. – Know that you cannot fail! Session Three: You CAN Have it ALL! – Magnetize a clear, soulful relationship with money, to support you in having the quality of life you choose now! – Dissolve what locks you into pushing love, prosperity and success away. – Develop the confidence to be in creative command of your life. – Revel in the union of love and prosperity. – Access the “treasure chest” within you that knows you can have it all! Use the powerful Magnetize Love & Prosperity Course to REGROUP. This is your magic moment to develop and activate the means to be in creative command of our life ~ to activate love and prosperity in the tangible. Deeply drink in the revelation of your true magnetic self in ALL you choose to create!